Kicking World shows you ways to get kicking on a budget. Want to become a better field goal kicker, punter or kickoff specialist? Here's free resources for you! Unfortunately not everyone is fortunate enough to be ‘rolling in the dough’. I understand not everyone has the money or the means to hire a private kicking coach to teach their son the fine art of placekicking and punting. Well with this said, over the years Kicking World has created a cost-effective way to get ANYONE the training they deserve, no matter where you live and what your economic status is; we have a solution for you! Coach Brent Grablachoff started Kicking World a couple years after his college football career. At the beginning of his humble start he didn’t always have hundreds of kicking students like he does today. He started small just like any business, but with consistent hard work, referrals and results he obtained for his students; the business grew fast! When he first started his objective was to create a means for anyone to see him for kicking lessons and no one would ever be turned away. Now as Kicking World has grown to a world-class leader in Personalized Kicking & Punting Instruction, there’s not enough time in the day for him to service everyone. So Brent created a very economical package that will get you great training for a low price. Of course seeing him and his staff in person for private lessons or a camp is the BEST solution, but in case that is not an option for you, we have some great ideas to help get you kicking on a budget! What is this you may ask? Well it is a way for you to get a ‘jump start’ on your kicking by sending Coach Brent recent video footage of you kicking or punting. Coach Brent will review your footage and then schedule a call to discuss all the fine points over the phone with you and your Dad, Mom or Coach. In addition to the ‘virtual private lesson’ over the phone, you will also get an e-mail recap of everything so you can have it on hand and available to reference as you begin your new training regime! We hold monthly contests on our Facebook Page and give away awesome prizes like t-shirts, hats, hoodies and even free camp admissions! All you have to do is “LIKE” our Facebook page by going to that link above and clicking “LIKE”. You will then be able to interact with everyone at Kicking World and even make some new friends who are also kickers and punters. 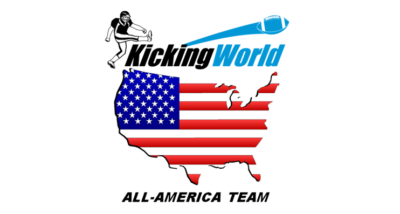 In case you don’t already know about our YouTube page, which is the leading football kicking video site in the country; we have hundreds of football kicking and punting videos available for FREE. These instructional videos educate you, help you visualize good form and allow you to learn a ton of new things about kicking and punting. You can also watch some of the wildest kicking videos you’ve probably ever seen. Some examples are 13 year olds hitting 60 yard field goals, Youth football players hitting 40+ yard field goals, Onside Kicks that stay in the air forever and kickoffs that go through the goal posts! Also, Coach Brent has a few instructional videos where he teaches you some of the basics of field goal kicking, punting and onside pop up kickoffs. Make sure you Subscribe after visiting Kicking World’s YouTube Channel. Lastly, here’s yet another FREE way to get kicking instruction without having to pay a dime! Simply add your e-mail address to our ‘VIP E-mail List’ signup form which is located on the home page of our website at www.kickingworld.com You will automatically start getting e-mails from Coach Brent which include free kicking tips, exclusive videos not seen on our YouTube page and the first to know about any upcoming camp dates. If you are not VIP yet, what are you waiting for? 6. Coming Soon! … The Complete Guide to Kicking DVD! We hope this list of the top 5 ways for you to get Kicking on a Budget has helped you. If you have any questions, feel free to contact us through our website, Facebook or YouTube pages. You can signup directly for a camp or private lesson on our website or feel free to Call Coach Brent for more info. Thanks for reading and best wishes for a great football career!